Paul Bird Motorsport rider Broc Parkes scored a point in 15th on his premier class Grand Prix debut, with teammate Michael Laverty following him home in 16th at Losail. Both Laverty and the experienced Australian Parkes, who was making his MotoGP™ debut, endured their fair share of up and downs during the extended free practice sessions aboard their Aprilia ART-powered machines in the Open class division. However, eventually it started to all come together and they qualified with Parkes on row seven and Laverty a row further back. Hopeful of a good result under the floodlights both riders made keen starts, Laverty's a bit too keen as he was adjudged to have jumped the start which resulted in a ride through penalty. Both riders circulated in the top 20 for the opening laps before Parkes upped the pace and by lap nine, he was 17th with Laverty's penalty keeping him from progressing any higher than 20th. Parkes eventually made his way up to 15th with Laverty following him up the order going into the penultimate lap and that's how they crossed the line after 22 hectic laps to allow Parkes to score a vital point as Laverty just missed out. Laverty commented, "That was a better race than I expected after a difficult weekend. My pace was good enough for 14th but the ride through penalty cost me dear. All in all it's been a positive start to the championship for us with Broc getting a point on the board and I'm really happy with how I rode though the 16th position finish didn't really do it justice." 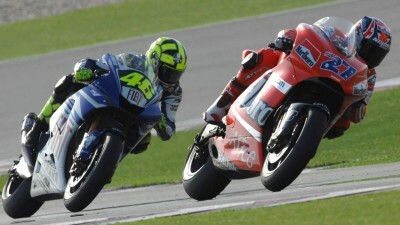 Parkes added, "To get a point on my MotoGP debut was fantastic for both me and the team. I was having a good dice with a couple of the other Open class bikes and we got lucky with a couple dropping out but I'll happily take the result. It was a shame Michael had his penalty otherwise he'd have been up there with us so roll on the next race in Texas where hopefully we continue where we left off this weekend."